In the present study, solar photocatalytic oxidation has been investigated through laboratory experiments as an alternative to conventional secondary treatment for the organic content reduction of high COD wastewater. Experiments have been performed on synthetic high COD wastewater for solar photocatalytic oxidation using a parabolic trough reactor. Parameters affecting the oxidation of organics have been investigated. The experimental design followed the sequence of dark adsorption studies of organics, followed by photolytic studies (in absence of catalyst) and finally photocatalytic studies in presence and absence of additional oxidant (H2O2). All the experimental studies have been performed at pH values of 2, 4, 6,8,10 and the initial pH value of the wastewater (normal pH). For photocatalytic studies, TiO2 has been used as a photocatalyst. Optimization of catalyst dose, pH and H2O2 concentration has been done. Maximum reduction of organic content was observed at the normal pH value of the wastewater (pH = 6.8). The reaction rate was significantly enhanced in presence of hydrogen peroxide. The optimum pH other than the Normal was in the alkaline range. Acidic pH was not found to be favourable for organic content reduction. pH was found to be a dominant factor affecting reaction rate even in presence of H2O2 as an additional oxidant. Also, the solar detoxification process was effective in treating a waste with a COD level of more than 7500 mg/L, which is a otherwise a difficult waste to treat. It can therefore be used as a treatment step in the high organic wastewater treatment during the primary stage also as it effectively reduces the COD content by 86%. Industrial wastes, sewage and a wide array of synthetic chemicals, pollute considerable parts of water resources . The elimination of toxic chemicals from wastewater is presently one of the most important aspects of pollution control. It causes problems to the classical biological treatment . A wide range of organic compounds are detected in high organic wastewater. Some of these compound both synthetic organic chemical as well as naturally occurring substances, also pose severe problem in biological treatment . The photocatalytic degradation method is fast, effective, ecofriendly, economically viable and efficient method in the waste water treatment . Semiconductor photocatalytic process has shown a great potential as a low-cost, environmental friendly and sustainable treatment technology to align with the “zero” waste scheme in the water/wastewater . The photocatalysis is one of the techniques, which are called "advanced oxidation processes (AOPs)". These processes can completely degrade the organic pollutants into harmless inorganic substances such as CO2 and H2O under moderate conditions . It has been found that solar detoxification is one of the promising methods for the disinfection of the wastewater. Solar detoxification process uses sunlight as the primary energy input required in reactions that break down contaminant molecules in CO2 and water. The combination of light and catalysts has proven very effective for wastewater purification. The solar photocatalytic detoxification process uses the near ultraviolet band of the solar spectrum (wavelength under 390 nm) to promote oxidative / reductive reactions . The solar photocatalytic wastewater treatment is based on reactive free potent chemical oxidants such as the hydroxyl radical. The aim of the paper is to develop a method which takes care of energy and water conservation together. Solar photocatalytic oxidation of synthetic high organic wastewater is investigated in a trough collector with a parabolic reflector. Wastewater with a high COD of the order of more than 7500 mg/L is treated. The effect of parameters like optimum catalyst doses, pH and concentration of an additional oxidant (H2O2) has also been investigated, and to investigate the role of dark absorption of synthetic high organic wastewater constituents. The study will lead to a possibility of implementation of solar detoxification process as a treatment step for high organic wastewater. All the photoreaction experiments were performed under ambient conditions on the open roof of the building of School of Energy and Environmental Studies, Devi Ahilya University campus, located in Indore. The study area Indore (India) is situated at 22°43′ N, 75°48′ E. In most parts of India, clear sunny weather is experienced 250 to 300 days a year this makes India a suitable site for the solar-based treatment processes. The solar radiation intensity was 650 W/m2 during maximum experimental runs. Average mean peak irradiance of Solar UV- A is 47 W/m2 to 66 W/m2 and average mean peak irradiance of Solar UV-B is 0.195 W/m2 to 0.3384 W/m2, corresponding to Indore field conditions . All the experiments were carried out in a concentrating solar collector with a parabolic trough reflector. The photoreactor used was a transparent borosilicate glass tube with 38 mm internal diameter, 1.8 m length, mounted on a parabolic trough reflector of aperture length 172 cm and aperture width 57.75 cm. The system is shown in Figure 1. It maintains the turbulent conditions and there is no mass transfer limitation. It is a nearly closed system no vaporization of volatile compounds takes place. The size of the parabolic trough concentrator used in this study is even smaller when compared to the systems used by [8, 9]. The temperature rise is also not very high (maximum 55–60°C) curtailing the need for any external cooling device. 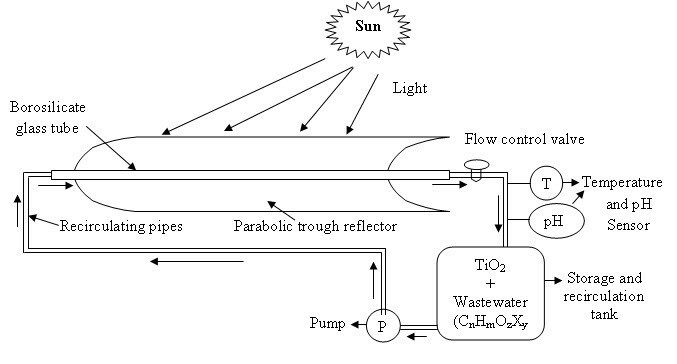 Schematic diagram of solar photocatalytic pilot plant reactors system (one parabolic trough reflector + tank + pump + connections). The initial simulated volume of wastewater was 5 L for photocatalytic experiments. The reactor volume was 1 L. TiO2 was added in the form of a suspension, after collection of an initial sample of the wastewater. Thereafter, the samples were collected at regular intervals of 60 minutes. The time period of experiments was upto 300 minutes. The composition and preparation of synthetic high organic wastewater used for the study is given in Table 1 and its physicochemical characteristics are given in Table 2. Chemical oxygen demand (COD) was measured according to the Standard Methods (APHA, 1995) under section 5220. TiO2 (Marck) photocatalyst was used as received. Anatase was the major crystalline phase in TiO2 as determined by XRD analysis (performed by rigaku RUH 3R instrument) and the surface area is 10.5 m2/g . Solar intensity, temperature and pH were monitored regularly throughout the experiment. Solar intensity was measured using a solarimeter (Make- SM 201 Solar, Central Electronic Ltd., India). H2SO4 and NaOH were used to adjust the solution pH. Temperature and pH levels were monitored by using a digital temperature indicator and pH meter. COD was estimated before and after treatment. 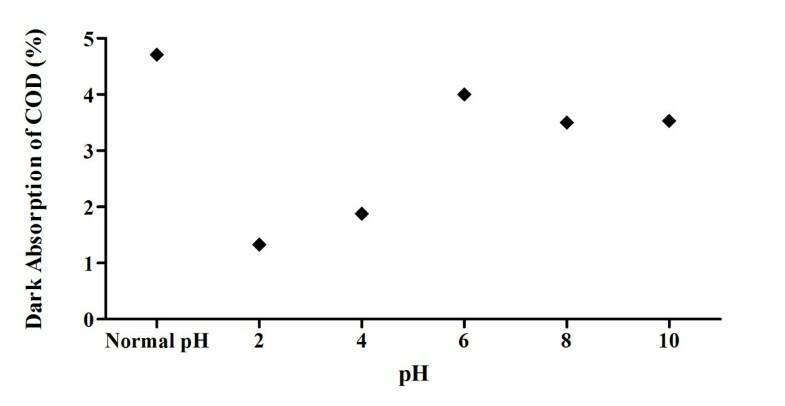 The effect of pH on dark adsorption of COD is shown in Figure 2. The sample used was similar to that of photoreduction experiments. It is clear that adsorption is maximum at Normal pH and consequently the degradation is also maximum at this pH. Adsorption was favoured more in the alkaline and neutral pH range . Experiments were performed in absence of TiO2 to explore the possibility of photolytic reactions. Initially, the photolytic reactions were performed at the actual pH value of the wastewater without any pH alteration (pH = 6.8). This experiment was followed by the reaction at different pH values of 2, 4, 6, 8 and10. The results are depicted in Figure 3. Maximum COD decrease of 47% was observed at Normal pH in 240 minutes. No further decrease was observed on performing the reaction till 300 minutes. As compared to acidic pH values, the decrease was more in the neutral and alkaline pH range. In 240 minutes, 40%, 37.5% and 35% decrease was observed at pH values 6, 8 and 10 respectively. The maximum degradation rate was obtained by simultaneous application of both the methods at neutral pH values . The decrease in adsorption values may be due to the abundance of OH- ions, causing increased hindrance to diffusion of organics . The reaction rate was very slow in the acidic pH range. At pH = 4, 23.5% reduction in 180 minutes was observed. No further decrease was observed on carrying out the reaction upto 300 minutes. A 20% decrease in the initial COD value was observed at pH = 2 in 240 minutes. The catalyst concentration was varied as 0.5, 1, 1.5 and 2 g/L to obtain an optimum concentration to be used for further experiments. pH value was also altered for all the catalyst doses. Experiments were performed at Normal pH, 2, 4, 6, 8 and 10 values for all the mentioned catalyst concentrations. 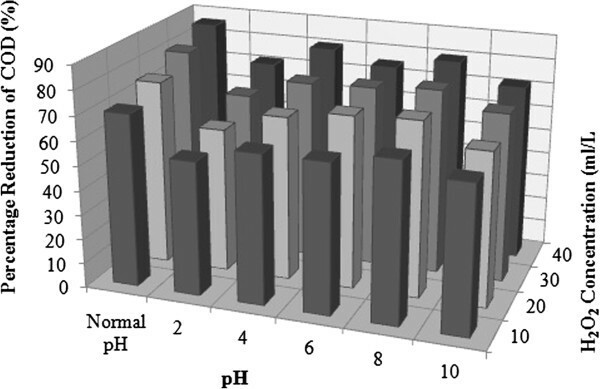 The effect of pH on dark adsorption of organic compounds is shown in Figure 4. The wastewater and catalyst concentration used was similar to that of photoreduction experiments. It is clear that adsorption is maximum at Normal pH in different TiO2 concentration (0.5, 1, 1.5 and 2 g/L) and consequently the degradation is also maximum at this pH as per the mechanism in which the adsorbed substrate reacts with ·OH on the TiO2 surface. Dark adsorption of organics at different pH values initial COD concentration = >7500 mg/L; TiO 2 = variable; average temperature = 23°C. The effluent pH affects the surface of titania by protonation or deprotonation according to equations (1) and (2) . A similar effect of effluent pH on the surface of TiO2, and they proposed the formation of three different species to account for variations of the behaviour of the catalyst with pH . The species, namely TiOH, TiOH2+ and TiO− (equations (1) and (4)) are formed on the amphoteric surface due to acid–base equilibria depending on the solution pH and the point-of-zero charge (pzc) of the catalyst. Positive holes are the predominant oxidation species at low pH while ·OH are abundant in wastewater at high and neutral pH [17, 18]. Generally, an increase in catalyst concentration results in a very rapid increase in degradation, which confirms to a heterogeneous regime . The catalyst concentration was varied as 0.5, 1, 1.5 and 2 g/L to obtain an optimum concentration to be used for further experiments. pH value was also altered for all the catalyst doses. Experiments were performed at Normal, 2, 4, 6, 8 and 10 pH values for all the mentioned catalyst concentrations. The results are shown in Figure 5. Effect of pH on percentage reduction of COD using solar radiation. Plot of COD reduction versus pH; initial concentration = >7500 mg/L; TiO2 = variable; average solar intensity = 80 W/m2; average temperature 32°C. Increase in concentration of TiO2 increases the number of active sites on the photocatalyst surface, which in turn increases the number of OH° radicals. A reverse effect occurs when the TiO2 concentration increases to higher than the optimum value, the degradation rate declines due to the interference of the light by the suspension [19–21]. At the normal pH value of wastewater and a catalyst concentration of 0.5 g/L, 54% decrease in COD was observed in 240 minutes of reaction time period and no further reaction occurred. On increasing the concentration of catalyst to 1 g/L, 60% COD decrease was observed in 180 minutes of time. No further decrease was observed. Similar trends were observed on increasing the concentration of catalyst to 1.5 and 2 g/L, in which 64% and 68% COD decrease was observed in 180 minutes stopping the reaction thereafter. The rate constant values in Table 3 were found to increase upto TiO2 concentration of 1.5 g/L. No significant increase is observed for 2 g/L of TiO2. Possibly, high TiO2 concentration hinders the light penetration, thereby decreasing the reaction rate. At pH = 2, COD decrease was very low. At 0.5 g/L of catalyst concentration, 25.5% of COD decrease was observed in 180 minutes. No significant reaction was observed after this time. At 1 g/L of catalyst concentration, 40% decrease was observed in 180 minutes with a slow increase upto 42.8% in 240 minutes. Similarly a maximum of 44.4% and 47.2% reduction was observed in 240 minutes in 1.5 and 2 g/L of catalyst concentration with 43% and 44.4% decrease in 180 minutes respectively. The rate constant values at pH = 2 (Table 3), indicate that an increase of rate upto 1 g/L of catalyst concentration. No further increase in rate was observed with increasing TiO2 dose, indicating that pH was the governing factor in determining the reaction rate. On increasing the pH value to 4, overall 30% COD decrease was observed in 180 minutes and no further reaction was seen at 0.5 g/L of catalyst concentration. At 1 and 1.5 g/L of catalyst concentration, 46% and 51% COD decrease was observed in 240 minutes. At a catalyst concentration of 2 g/L, 51% decrease occurred in 180 minutes and no further significant reaction occurred. The rate constant values are also low as observed at pH = 2. At pH value of 6, 41.5%, 57%, 61.6% and 64.6% of overall COD decrease was observed in 240 minutes at the catalyst concentration of 0.5, 1, 1.5 and 2 g/L respectively. No further decrease in COD was observed upto 300 minutes. The decrease was steady with respect to time. In a similar study, the maximum degradation was observed at pH = 6 . The rate constant values increased significantly on increasing the TiO2 dose from 0.5 to 1 g/L. However, not much increase in rate was observed for 1.5 and 2 g/L of catalyst concentrations. At pH = 8, reaction was slightly faster as compared to pH = 6. A COD decrease of 41%, 47%, 51% and 52% was observed in 180 minutes for 0.5, 1, 1.5 and 2 g/L catalyst concentrations respectively. No significant decrease was observed on further solar exposure upto 300 minutes. The rate constant values indicate no significant improvement with the TiO2 dose. The overall rates were less than those observed at pH = 6 and at normal pH values. At pH 10 and 0.5 g/L of catalyst concentration, COD decrease of 37.5% in 240 minutes and 40.6% in 300 minutes was observed. For 1, 1.5 and 2 g/L, 48%, 52% and 53% COD decrease was observed respectively in 240 minutes, indicating a slow and almost similar reaction rate at pH = 8 for these catalyst concentrations. First order rate constant values at pH = 10 (Table 3) were nearly similar to those obtained for pH = 8. An overall assessment of this study shows that pH plays even a more significant role than catalyst dose or other factors. Maximum and fastest reaction was observed at Normal pH values (pH = 6.8) even at 0.5 g/L of catalyst concentration. A similar trend of maximum COD decrease at normal pH was observed in absence of TiO2. Acidic condition was less favourable than normal and alkaline pH due to amphoteric behaviour above and below point of zero charge (pzc) . The pzc value was found at pH = 6.25. The TiO2 surface is positively charged in acidic media (pH < 6.25), whereas it is negatively charged under alkaline conditions (pH > 6.25). The reaction rates are dominated by pH alterations. Nearly similar trends of decrease were observed at concentration. 0.5, 1, 1.5 and 2 g/L for all pH values. No doubling effect of catalyst was observed which prompted us to select 1 g/L as an optimum concentration for further experimental runs. The beneficial role of H2O2 in photo reduction was found to be remarkable; however there are other, more subtle effects. For example, the amount of COD initially absorbed on TiO2 (in the dark) was affected as the H2O2 concentration was increased. This trend is given in Figure 6. Dark adsorption was found to increase with increasing H2O2 concentration. Dark adsorption of organics at different pH values; initial COD concentration = >7500 mg/L; H 2 O 2 = variable; TiO 2 = 1 g/L; average temperature = 23°C. The low adsorption obtained might be due to the adverse effect of excess H2O2 on the reaction as described, that H2O2 consumes generated ·OH if the optimal dosage is not computed and employed [24, 25]. At Normal pH, 7.7% and 8.3% dark absorption was observed at the H2O2 concentrations of 10 and 20 mL/L respectively. At 30 mL/L and 40 mL/L of H2O2 concentration, 10.8% and 12.3% adsorption of organics was observed. At pH = 2, 5.4%, 6.6% and 7.5% dark absorption at the H2O2 concentrations of 10 mL/L, 20 mL/L and 30 mL/L and 40 mL/L of H2O2 concentration the reaction was faster and 8.6% adsorption was observed. At pH = 4, a 6.6% decrease at H2O2 concentration of 10 mL/L was observed. On increasing the concentration to 20 mL/L and 30 mL/L, dark absorption was 7.5% and 7.7% respectively in 240 minutes. At 40 mL/L of H2O2 concentration, 8.8% adsorption was seen in 240 minutes which did not increase further even after 240 minutes. At pH = 6, a dark absorption of 6.4%, 7.08%,7.5% and 7.8% was observed in 240 minutes for 10, 20, 30 mL/L and 40 mL/L of H2O2 concentration respectively. No further reaction was observed after 240 minutes. At pH = 8, a maximum of 6.6% and 7.8% absorption of COD decrease were observed in 240 minutes at 10 and 20 mL/L of H2O2 concentrations respectively. At 30 mL/L and 40 mL/L of H2O2 concentration, a maximum of 8.6% and 8.7% decrease was observed respectively in 180 minutes. At pH value of 10, adsorption of 5.5%, 6.4%, 6.8% and 7.6% was observed in 240 minutes for 10, 20, 30 and 40 mL/L H2O2 concentrations respectively. The trends of dark adsorption were similar to that of photocatalytic reaction. H2O2 was added as oxidizing agent to enhance the reaction rate. Concentration of H2O2 was varied to 10, 20, 30 and 40 mL/L. The results are given in Figure 7. Effect of pH on percentage reduction of COD in presence of H 2 O 2 using solar radiation. Plot of COD reduction versus pH; Initial concentration = >7500 mg/L; H2O2 = variable; TiO2 = 1 g/L; average solar intensity = 80 W/m2; average temperature = 23°C. At normal pH and 10 mL/L of H2O2, 68% of COD decrease was observed in 240 minutes which increased to 70.5% in 300 minutes. On increasing the concentration of H2O2 to 20 mL/L, 74.4% COD decrease was observed in 240 minutes. No significant reduction was observed after that. Further on increasing the concentration to 30 mL/L, the reaction became faster. A 69.4% COD decrease was observed in 180 minutes of solar exposure, which further increased to 81% in 240 minutes. On adding 40 mL/L of H2O2, a maximum decrease of 86.3% was observed in 180 minutes of time period. However, the reaction halted after that indicating a possible consumption of H2O2. The rate constant values in presence of H2O2 (Table 4) were highest for the normal pH values among all the experiments performed. The values increased steadily with an increasing concentration of H2O2, with a maximum of the order of 0.0076 1/min. At pH = 2, 54.7%, 58.9% and 65% COD decrease was observed at the H2O2 concentrations of 10, 20 and 30 mL/L. At 40 mL/L of H2O2 concentration the reaction was faster, 71.5% COD decrease was observed in 180 minutes of time period. Rate constant value of 0.0047 1/min was observed for 40 mL/L of H2O2. In spite of acidic pH values, which showed overall slow reaction rates for all the experiments performed, a doubling of rate was observed in presence of H2O2 even for this pH value. At pH = 4, a 57.8% decrease in 180 minutes and 61% in 240 minutes at H2O2 concentration of 10 mL/L was observed. On increasing the concentration to 20 mL/L, COD decrease was 60.6% in 180 mins which further increased to 67% in 240 minutes. On increasing the concentration to 30 mL/L, 67.7% decrease was observed in 180 minutes which increased to 73% in 240 minutes. At 40 mL/L of H2O2 concentration, 71.7% COD decrease occurred in 180 minutes which increased to 80.4% in 240 minutes. At pH = 6, a COD decrease of 61%, 70.5% and 74% was observed in 240 minutes for 10, 20 and 30 mL/L of H2O2 concentration respectively. At 40 mL/L of H2O2, the reaction was fastest with 75% of COD decrease in 180 minutes. At pH = 8, 57.8% COD decrease was observed in 180 minutes which further increased to 64.2% in 240 minutes. On doubling the H2O2 concentration, 59% decrease occurred in 180 minutes which further increased to 71.5% in 240 minutes. On tripling the H2O2 concentration a maximum COD decrease of 69.5% occurred in 180 minutes which was merely increased to 75.7% in 240 minutes. At 40 mL/L of H2O2, 76.8% COD decrease occurred in 180 minutes which increased just to 80% in 240 minutes. At pH = 10, a maximum of 58.9% and 62.7% COD decrease was observed in 240 minutes at 10 and 20 mL/L of H2O2 concentrations respectively. At 30 mL/L and 40 mL/L of H2O2 concentration, a maximum of 69% and 71.5% decrease was observed respectively in 180 minutes. Rate constant values at pH = 4, 6 and 8 were quite similar being maximum 0.0062 1/min at 40 mL/L of H2O2. At pH 10 and pH = 4 the rate of reaction was slow and nearly similar rate constant values were obtained for both the pH values. Increase in the degradation efficiency under the alkaline conditions could be attributed to the increase in hydroxyl ions, which induce more hydroxyl radical formation. In acidic condition, the per-hydroxyl radical can form hydrogen peroxide, which in turn gives rise to the hydroxyl radical , making the reaction slower. Presence of H2O2 significantly enhanced the reaction rate and percentage decrease of organic content was significantly higher as compared to reactions without H2O2. 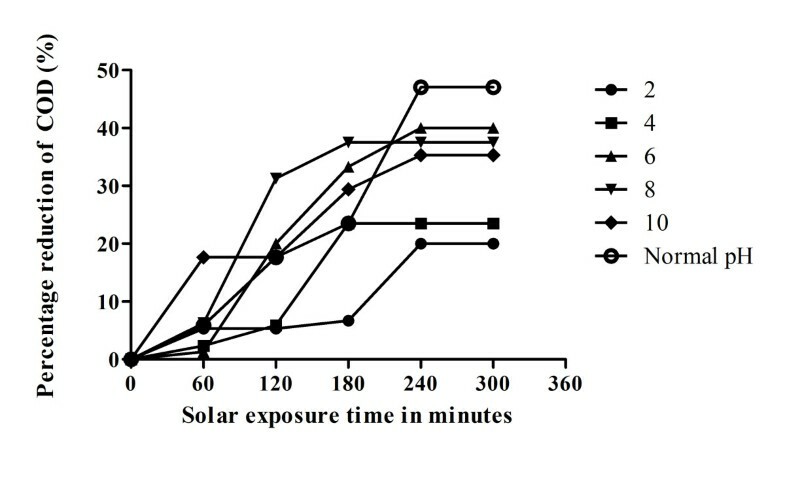 Although the maximum intensity of solar radiations was available in the initial 2-4 hours, the maximum reduction was obtained in first two hours of solar exposure in all the experimental run. It can be presumed that the reaction was performed efficiently at the solar irradiation between 600-865 W/m2 (Tables 5 and 6). Some replicate experimental run performed on a cloudy day, (solar irradiation 200-250 W/m2), showed low significant COD reduction in 5 hours. It is reported  that above a certain value (estimated to be 25 W/m2 of UV in laboratory experiments); the reaction rate becomes proportional to the square root of UV intensity. From where the slope of the plot ln (C)/Co vs. t (time of irradiation) renders the reaction rate constant (k). Since the rate of reduction was found to varied with the initial concentration of H2O2, the initial rate determined for COD reduction are compared with the increasing concentration. The L-H plots the values of slope (R2) and equation for the trend line with respect to increase in H2O2 concentrations. A straight line was obtained on plotting the 1/rate versus 1/concentration of TiO2 and H2O2 separately. It can be observed that the L-H mechanism was followed with respect to increasing H2O2 concentrations in the wastewater shown in (Tables 3 and 4) with high correlation coefficients. Solar detoxification process was effective in treating a wastewater with a COD level of the order of more than 7500 mg/L, which is otherwise a difficult waste to treat. It can therefore be used as a treatment step in the high organic wastewater treatment during the primary stage also as it effectively reduces the COD content by 86%. The rate of degradation is faster with concentrated solar radiation. pH was found be a dominant factor affecting reaction rate even in presence of additional oxidant. Maximum reduction of organic content was observed at the normal pH value of the wastewater (pH = 6.8) for all the experimental runs. Therefore there would be no requirement of any pH alteration for wastewater treatment by this technique. Thus, solar detoxification of high COD wastewater is a unique treatment process utilizing renewable solar energy and treating the wastewater with minimum chemical input. The authors are thankful to the School of Energy and Environmental Studies, Devi Ahilya University, Indore, India, for providing laboratory facilities. The authors are thankful to the Ministry of New and Renewable Energy (MNRE), TERI University, New Delhi, India, for providing the financial support for the research. The overall implementation of this study including experiments, data analysis, and manuscript preparation were the results of joint efforts by individuals who are listed as co-authors of this paper. All authors have made extensive contribution into the review and finalization of this manuscript. All authors read and approved the final manuscript.